If you own a business premises within a commercial, military or industrial area you can have a prefabricated guard shack installed. These shacks can offer you with an immediate solution for your security needs. The guard shack will be pre-assembled before it reaches your premises. You can choose from either an exterior or interior system to suit your security needs. When you order your prefabricated guard shack it will be built to your specifications. The design is modular which means you can easily add on any additions or modify the system when needed. The base of the system is made from steel making it a portable guard shack that you can easily transport if you move business premises.You are able to choose from having the building structure assembled on site or have the system pre-assembled. If you require a structure used for issuing tickets you are able to choose from five sizes. The ticket booths are constructed out of steel panels of high quality. The units are pre-assembled with a steel base. The units have floors which are powder coated, the doors are half glass half metal. The roofs are flat along with a gutter built into the structure. 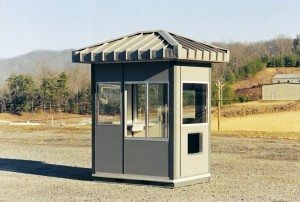 When you choose a guard tower the raised structure can provide you with additional security features due to the long distance view without any obstructions. The guard tower is manufactured and designed alongside engineers to offer customers with a modular construction. That will add quality control along with a cost effective method on security measures. The components for the guard towers will be manufactured on you business premises. The parts will include railings, stairs, skinned booths made from aluminum, mezzanine towers. The booths are designed to provide protection and comfort for your security guards. 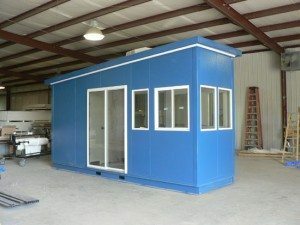 A Prefab guard shack is not only attractive but extremely durable and they are ideal for a variety of industrial and modular building applications. The prefabricated buildings can add space to your existing setup. When selecting a prefabricated guard shack you are offered with an affordable option compared to conventional constructions. The panelized buildings made from metal are considered to be value for money due to the outstanding quality of the structures. You can choose to have your guard booth finished off with a stone or brick facade. Additionally you can add in either a roof or awning to suit your needs. There is a selection of floor types, ceiling systems, counter-tops and panel finishes to choose from to custom design the guard house you require. When you order a prefabricated guard shack you are offered with various benefits, one of the benefits is the order system is incredibly easy. You won’t have to worry about having to assemble the structure as it can be pre-assembled or erected on your business premises. When you want to relocate you can easily transport your guard shack with you. The guard house can be lifted with a fork lift or a crane. The main benefit of the guard shack is that it will be delivered within a few days of your order and will be ready to use immediately.